Chilli Paneer Recipe | How to Make Chilli Paneer? 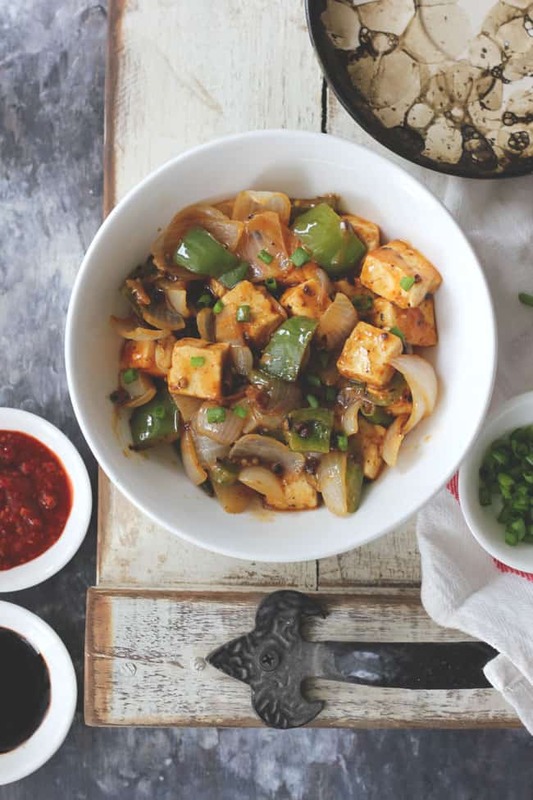 This Chilli Paneer recipe is quick and easy to make, and perfect for parties and quick weeknight dinners! Serve it with fried rice and you will have a delicious Indo- Chinese flavour inspired meal in few minutes. 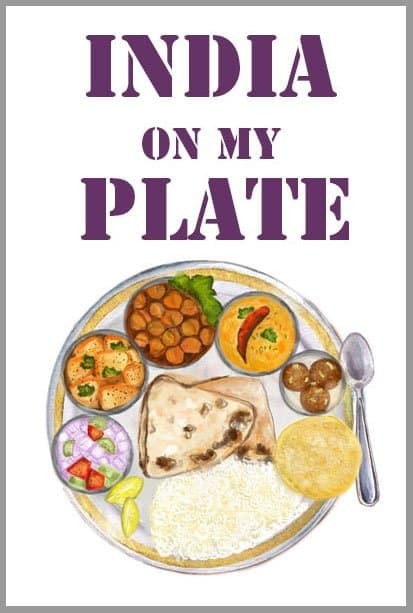 We, in India, love paneer and anything loaded with Indo-Chinese flavours. Chilli Paneer is the perfect combination of these two crowd charming favourites. After all, who doesn’t like a delicious bowl of chilli paneer for snacks or for dinner tucked inside the crispy paratha? Ohh yes! The chilli paneer makes an excellent stuffing for the quick weeknight chapati/paratha wraps. And that is probably one of my favourite ways to use the leftover chilli paneer. My mom used to make chilli paneer regularly when we were kids. The leftovers from the dinner were wisely used next day to make wraps for our school lunchboxes. And we always came home with an empty lunchbox. You can use the chilli paneer to make vegetarian chapati wraps or tortilla wraps for the evening snacks and school lunchboxes. Chilli Paneer combined with a tablespoon of mayonnaise makes an excellent sandwich stuffing. Grill the sandwich and serve it with schezwan sauce. Roughly chop the leftover chilli paneer and stuff it inside the paratha. And enjoy the Chilli Paneer Paratha for breakfast with ketchup. Ok, let’s get right to it. Here are the important things I have learned over the years about making an excellent Chilli Paneer. Try to use the fresh and best quality paneer for the dish. And do not overcook the paneer. Shallow fry it till light brown and avoid deep-frying it. Marination is one crucial step in the making of Chilli Paneer. Marinate paneer for at-least 30 minutes before shallow frying. Cooking for too long is the last thing that you want to do to a Chilli Paneer. It has to be quickly stir-fried. So that the vegetables do not lose their crunch and the paneer turn chewy. To make Chilli Paneer little extra sauce, add 1/4 Cup of water while cooking vegetables. Simmer the sauce until it thickens. And then add the paneer. If you prefer dry Chilli Paneer do not add more than 2 – 3 tablespoons of water. At last, allow the paneer, to absorb the flavor of the sauce. Let Chilli Paneer sit in the pan for at least 5 – 10 minutes before serving. Hope these tips will help you make an excellent, restaurant like Chilli Paneer. If yes, then for more such fun recipes in your life, follow along on Facebook, Instagram, or subscribe to our Youtube Channel. 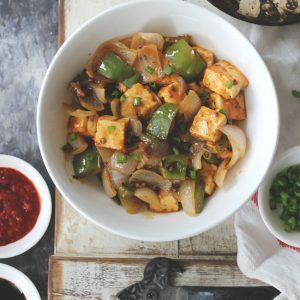 This Chilli Paneer recipe is quick and easy to make, and perfect for parties and quick weeknight dinners! 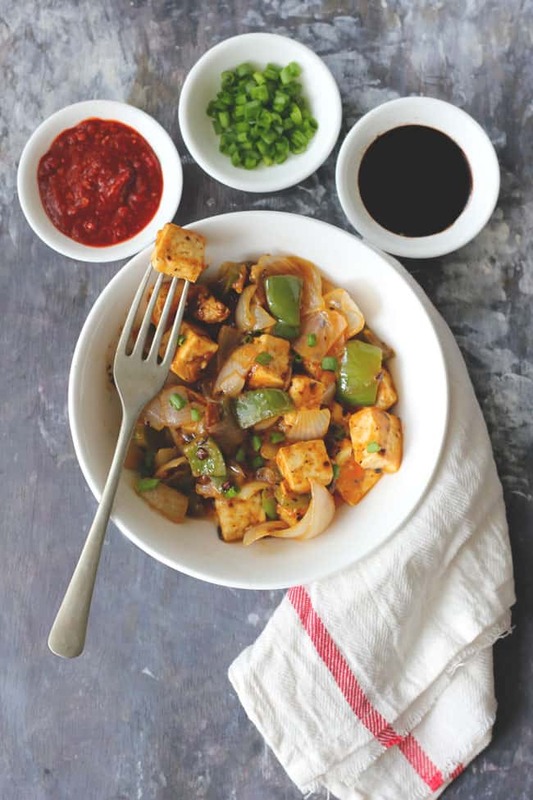 Learn how to make restaurant style chilli paneer in few simple steps. Marinade the paneer cubes in corn flour, soy sauce, tomato ketchup and salt. Add a tablespoon of water if the marinade is too thick. Keep the marinated paneer in the fridge for atleast 30 minutes and maximum 1 hour. Heat oil in a deep-frying pan. Shallow fry the paneer cubes until light golden in color from both the sides. Do not turn the paneer cubes more than once. Reserve the remaining liquid from the marinated paneer to be used later. Transfer to a plate lined with paper towel. Set aside. In the same pan add ginger and garlic. Stir fry for 2 - 3 minutes. Add onion, green chillies and stir-fry over a high flame for 2 - 3 minutes. Add the capsicum and sauté for a minute or so. Add the soy sauce, tomato ketchup, salt, black pepper and 1/4 Cup of water. Mix well. Now add the reserved cornflour mixture from the marinade and the paneer cubes. Stir well. The sauce will start thickening now. Taste and adjust the seasoning. Once the sauce thickens, turn off the heat. Cover the pan with the lid and let the paneer absorb the flavor of the sauce for few minutes before serving. Garnish the chilli paneer with chopped spring onion greens. Serve Chilli Paneer with fried rice ( see recipe ).